The GROBID Web API provides a simple and efficient way to use the tool. A service console is available to test GROBID in a human friendly manner. For production and benchmarking, we strongly recommand to use this web service mode on a multi-core machine and to avoid running GROBID in the batch mode. Go under the grobid/ main directory. Be sure that the GROBID project is built, see Install GROBID. The service provides also an admin console, reachable at http://yourhost:8071 where some additional checks like ping, metrics, hearthbeat are available. We recommend, in particular to have a look at the metrics (using the Metric library) which are providing the rate of execution as well as the throughput of each entry point. If required, modify the file under grobid/grobid-service/config/config.yaml for starting the server on a different port or if you need to change the absolute path to your grobid-home (e.g. when running on production). By default grobid-home is located under grobid/grobid-home. grobid-home contains all the models and static resources required to run GROBID. All these clients will take advantage of the multi-threading for scaling PDF batch processing. As a consequence, they will be much more efficient than the batch command lines (which use only one thread) and should be prefered. 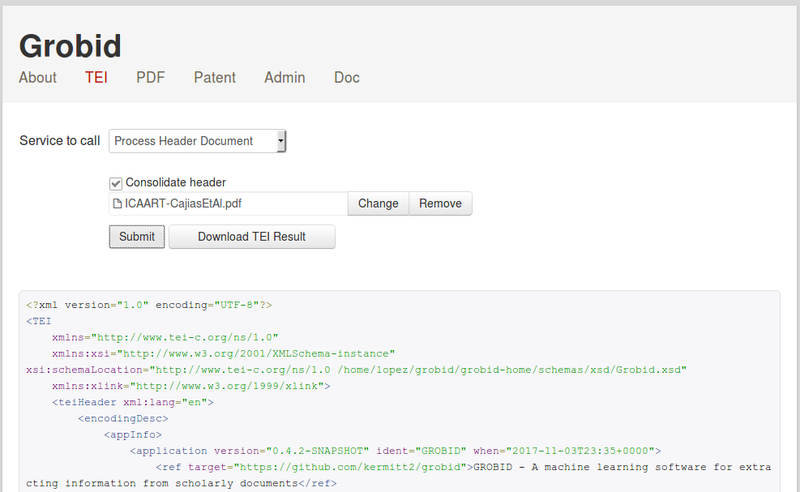 Extract the header of the input PDF document, normalize it and convert it into a TEI XML format. consolidateHeader is a string of value 0 (no consolidation) or 1 (consolidate and inject all extra metadata, default value), or 2 (consolidate and inject only the DOI value). consolidateHeader optional consolidateHeader is a string of value 0 (no consolidation) or 1 (consolidate and inject all extra metadata, default value), or 2 (consolidate and inject only the DOI value). A 503 error with the default parallel mode normally means that all the threads available to GROBID are currently used. The client need to re-send the query after a wait time that will allow the server to free some threads. The wait time depends on the service and the capacities of the server, we suggest 2 seconds for the processHeaderDocument service. Convert the complete input document into TEI XML format (header, body and bibliographical section). consolidateCitations optional consolidateCitations is a string of value 0 (no consolidation, default value) or 1 (consolidate and inject all extra metadata), or 2 (consolidate and inject only the DOI value). A 503 error with the default parallel mode normally means that all the threads available to GROBID are currently used. The client need to re-send the query after a wait time that will allow the server to free some threads. The wait time depends on the service and the capacities of the server, we suggest 5-10 seconds for the processFulltextDocument service. Extract and convert all the bibliographical references present in the input document into TEI XML format. consolidateCitations optional is a string of value 0 (no consolidation, default value) or 1 (consolidate all found bib. ref. and inject all extra metadata), or 2 (consolidate all found bib. ref. and inject only the DOI value). A 503 error with the default parallel mode normally means that all the threads available to GROBID are currently used. The client need to re-send the query after a wait time that will allow the server to free some threads. The wait time depends on the service and the capacities of the server, we suggest 3-6 seconds for the processFulltextDocument service. Parse a raw date string and return the corresponding normalized date in ISO 8601 embedded in a TEI fragment. A 503 error with the default parallel mode normally means that all the threads available to GROBID are currently used. The client need to re-send the query after a wait time that will allow the server to free some threads. The wait time depends on the service and the capacities of the server, we suggest 1 seconds for the processDate service. Parse a raw string corresponding to a name or a sequence of names from a header section and return the corresponding normalized authors in TEI format. A 503 error with the default parallel mode normally means that all the threads available to GROBID are currently used. The client need to re-send the query after a wait time that will allow the server to free some threads. The wait time depends on the service and the capacities of the server, we suggest 1 seconds for the processHeaderNames service. Parse a raw sequence of names from a bibliographical reference and return the corresponding normalized authors in TEI format. A 503 error with the default parallel mode normally means that all the threads available to GROBID are currently used. The client need to re-send the query after a wait time that will allow the server to free some threads. The wait time depends on the service and the capacities of the server, we suggest 1 seconds for the processCitationNames service. Parse a raw sequence of affiliations/addresses with or without address and return the corresponding normalized affiliations with address in TEI format. A 503 error with the default parallel mode normally means that all the threads available to GROBID are currently used. The client need to re-send the query after a wait time that will allow the server to free some threads. The wait time depends on the service and the capacities of the server, we suggest 1 seconds for the processAffiliations service. Parse a raw bibliographical reference (in isolation) and return the corresponding normalized bibliographical reference in TEI format. A 503 error with the default parallel mode normally means that all the threads available to GROBID are currently used. The client need to re-send the query after a wait time that will allow the server to free some threads. The wait time depends on the service and the capacities of the server, we suggest 1 seconds for the processCitation service. Return JSON annotations with coordinates in the PDF to be processed, relative to the reference informations: reference callouts with links to the full bibliographical reference and bibliographical reference with possible external URL. For information about how the coordinates are provided, see Coordinates of structures in the original PDF. A 503 error with the default parallel mode normally means that all the threads available to GROBID are currently used. The client need to re-send the query after a wait time that will allow the server to free some threads. The wait time depends on the service and the capacities of the server, we suggest 3-6 seconds for the referenceAnnotations service. Return the PDF augmented with PDF annotations relative to the reference informations: reference callouts with links to the full bibliographical reference and bibliographical reference with possible external URL. Note that this service modify the original PDF, and thus be careful with legal right and reusability of such augmented PDF! For this reason, this service is proposed for experimental purposes and might be deprecated in future version of GROBID, in favor of the above /api/referenceAnnotations service. A 503 error with the default parallel mode normally means that all the threads available to GROBID are currently used. The client need to re-send the query after a wait time that will allow the server to free some threads. The wait time depends on the service and the capacities of the server, we suggest 5-10 seconds for the annotatePDF service. Extract and parse the patent and non patent citations in the description of a patent publication sent as UTF-8 text. Results are returned as a list of TEI citations. A 503 error with the default parallel mode normally means that all the threads available to GROBID are currently used. The client need to re-send the query after a wait time that will allow the server to free some threads. The wait time depends on the capacities of the server and the size of the input string, we suggest 5-10 seconds for the processCitationPatentTXT service. Extract and parse the patent and non patent citations in the description of a patent publication encoded in ST.36. Results are returned as a list of TEI citations. A 503 error with the default parallel mode normally means that all the threads available to GROBID are currently used. The client need to re-send the query after a wait time that will allow the server to free some threads. The wait time depends on the capacities of the server and the size of the input document, we suggest 5-10 seconds for the processCitationPatentST36 service. Extract and parse the patent and non patent citations in the description of a patent publication sent as PDF. Results are returned as a list of TEI citations. Note that the text layer must be available in the PDF to be processed (which is, surprisingly in this century, very rarely the case with the PDF avaialble from the main patent offices - however the patent publications that can be downloaded from Google Patents for instance have been processed by a good quality OCR). Extract and parse the patent and non patent citations in the description of a patent encoded in ST.36. Results are returned as a lits of TEI citations. A 503 error with the default parallel mode normally means that all the threads available to GROBID are currently used. The client need to re-send the query after a wait time that will allow the server to free some threads. The wait time depends on the capacities of the server and the size of the input document, we suggest 5-10 seconds for the processCitationPatentPDF service. This service is similar to /api/referenceAnnotations but for a patent document in PDF. JSON annotations relative the the input PDF are returned with coordinates as described in the page Coordinates of structures in the original PDF. Patent and non patent citations can be directly visualised on the PDF layout as illustrated by the GROBID console. For patent citations, the provided external reference informations are based on the patent number normalisation and relies on Espacenet, the patent access application from the European Patent office. 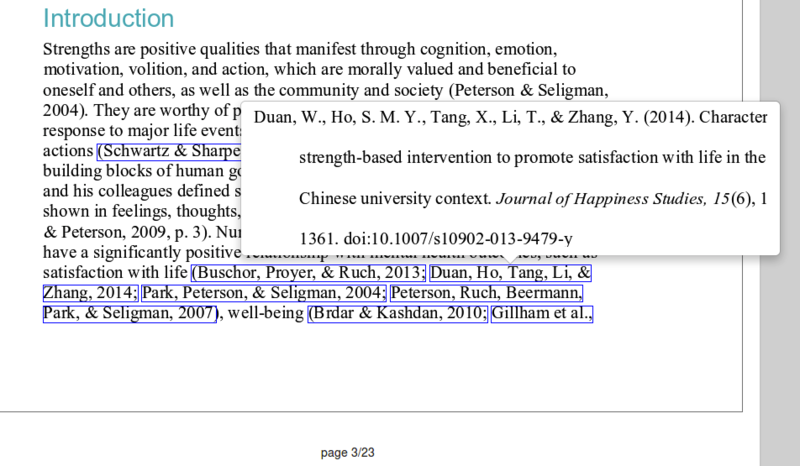 For non patent citation, the external references are similar as for a scientific article (CorssRef DOI link or arXiv.org if an arXiv ID is present). A 503 error with the default parallel mode normally means that all the threads available to GROBID are currently used. The client need to re-send the query after a wait time that will allow the server to free some threads. The wait time depends on the capacities of the server and the size of the input document, we suggest 5-10 seconds for the citationPatentAnnotations service. The Grobid RESTful API provides a very efficient way to use the library out of the box, because the service exploits multithreading. As Grobid is thread-safe and manages a pool of parser instances, it is advised to use several threads to call the REST service for scaling the processing to large collections of documents. This improves considerably the performance of the services for PDF processing because documents can be processed while other are uploading. When scaling the service, we think that it is better to maintain this value low (e.g. 1 second) to avoid putting too many open requests on the server.